The Election Commission would conduct intensive mapping aiming at getting the maximum number of differently-abled voters to exercise their franchise including in the 2019 Lok Sabha polls and later, an official said here on Saturday. “The Election Commission has asked all the states to conduct exhaustive mapping of differently-abled eligible voters so that maximum number of such voters can cast their votes in future elections…,” Tripura Chief Electoral Officer Sriram Taranikanti told the media here. “Special arrangements, including engagement of volunteers were always made in most of the polling stations for the differently-abled eligible voters. “Now the election authorities would conduct a study whether any polling station was missing in arranging the special arrangements for them. “Our target is to make user-friendly special arrangements for each and every otherwise-abled eligible voter in their respective or nearest polling stations,” he added. According to the 2011 census, there are 2.68 crore differently-abled people, which is 2.21 per cent of total of 121 crore population. Among the disabled population 56 per cent (1.5 crore) are men and 44 per cent (1.18 crore) are women. 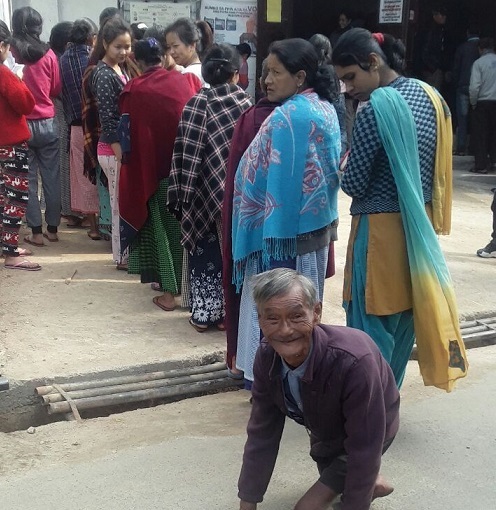 “Of the 2.68 crore otherwise-abled persons, around 1.75 crore likely to be eligible voters,” a senior official of the Tripura election department said. In Tripura, the Election Department would collect the number and other details of the state’s “differently-abled” population from the Social Welfare Department. The state has approximately 50,000 physically challenged voters. The Election Commission has directed conducting of a special summary revision of the electoral rolls of all states and Union Territories with January 1, 2019, as qualifying date of age. “After several months of long summary revision of the voters list, the final publication of the photo-affixed electoral rolls would be done in the first week of January 2019 and on the basis of that rolls, the Lok Sabha elections would be held,” Taranikanti said. On Saturday, with the publication of the draft electoral rolls several months long process for a special summary revision of the electoral rolls has begun. According to the draft rolls, Tripura currently has 25, 73,413 electorates, including 12, 68,027 women voters.